In the history of France, the First Republic (French: Première République), officially the French Republic (République française), was founded on 22 September 1792 during the French Revolution. The First Republic lasted until the declaration of the First Empire in 1804 under Napoleon, although the form of the government changed several times. This period was characterized by the fall of the monarchy, the establishment of the National Convention and the Reign of Terror, the Thermidorian Reaction and the founding of the Directory, and, finally, the creation of the Consulate and Napoleon's rise to power. Under the Legislative Assembly, which was in power before the proclamation of the First Republic, France was engaged in war with Prussia and Austria. In July 1792, the Duke of Brunswick, commanding general of the Austro–Prussian Army, issued his Brunswick Manifesto, in which he threatened the destruction of Paris should any harm come to King Louis XVI of France. The foreign threat exacerbated France's political turmoil amid the French Revolution and deepened the passion and sense of urgency among the various factions. In the violence of 10 August 1792, citizens stormed the Tuileries Palace, killing six hundred of the King's Swiss guards and insisting on the removal of the king. 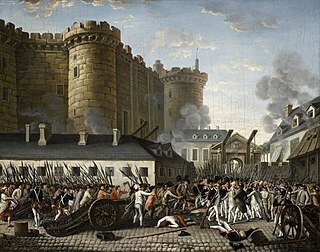 A renewed fear of anti-revolutionary action prompted further violence, and in the first week of September 1792, mobs of Parisians broke into the city's prisons, killing over half of the prisoners. This included nobles, clergymen, and political prisoners, but also numerous common criminals, such as prostitutes and petty thieves, many murdered in their cells—raped, stabbed, and slashed to death. This became known as the September Massacres. As a result of the spike in public violence and the political instability of the constitutional monarchy, a party of six members of France's Legislative Assembly was assigned the task of overseeing elections. The resulting Convention was founded with the dual purpose of abolishing the monarchy and drafting a new constitution. 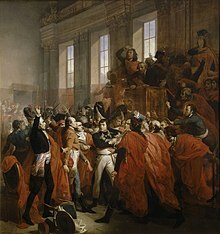 The Convention's first act, on 10 August 1792, was to establish the French First Republic and officially strip the king of all political powers. Louis XVI, by then a private citizen bearing his family name of Capet, was subsequently put on trial for crimes of high treason starting in December 1792. On 16 January 1793 he was convicted, and on 21 January, he was executed by guillotine. Throughout the winter of 1792 and spring of 1793, Paris was plagued by food riots and mass hunger. The new Convention did little to remedy the problem until late spring of 1793, occupied instead with matters of war. Finally, on 6 April 1793, the Convention created the Committee of Public Safety, and was given a monumental task: "To deal with the radical movements of the Enragés, food shortages and riots, the revolt in the Vendée and in Brittany, recent defeats of its armies, and the desertion of its commanding general." Most notably, the Committee of Public Safety instated a policy of terror, and the guillotine began to fall on perceived enemies of the republic at an ever-increasing rate, beginning the period known today as the Reign of Terror. Despite growing discontent with the National Convention as a ruling body, in June the Convention drafted the Constitution of 1793, which was ratified by popular vote in early August. However, the Committee of Public Safety was seen as an "emergency" government, and the rights guaranteed by the 1789 Declaration of the Rights of Man and of the Citizen and the new constitution were suspended under its control. The Committee's laws and policies took the revolution to unprecedented heights. After the arrest and execution of Robespierre in July 28, 1794, the Jacobin club was closed, and the surviving Girondins were reinstated. A year later, the National Convention adopted the Constitution of the Year III. They reestablished freedom of worship, began releasing large numbers of prisoners, and most importantly, initiated elections for a new legislative body. On 3 November 1795, the Directory was established. 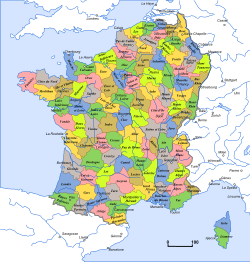 Under this system, France was led by a bicameral Parliament, consisting of an upper chamber called the Council of Elders (with 250 members) and a lower chamber called the Council of Five Hundred (with, accordingly, 500 members), and a collective Executive of five members called the Directory (from which the historical period gets its name). Due to internal instability, caused by hyperinflation of the paper monies called Assignats, and French military disasters in 1798 and 1799, the Directory lasted only four years, until overthrown in 1799. The period known as the French Consulate began with the coup of 18 Brumaire in 1799. Members of the Directory itself planned the coup, indicating clearly the failing power of the Directory. Napoleon Bonaparte was a co-conspirator in the coup, and became head of the government as the First Consul. He would later proclaim himself Emperor of the French, ending the First French Republic and ushering in the French First Empire. Wikimedia Commons has media related to French First Republic. ^ Mould, Michael (2011). The Routledge Dictionary of Cultural References in Modern French. New York: Taylor & Francis. p. 147. ISBN 978-1-136-82573-6. Retrieved 23 November 2011. ^ Censer, Jack R. and Hunt, Lynn. Liberty, Equality, Fraternity: Exploring the French Revolution. University Park, Pennsylvania: Pennsylvania State University Press, 2004. ^ Doyle, William. The Oxford History of The French Revolution. Oxford: Oxford University Press, 1989. pp 191–92. ^ Doyle, William. The Oxford History of the French Revolution. Oxford: Oxford University Press, 1989. pp 196. ^ The French Revolution [videorecording] : liberté, egalité, fraternité, a hitler Jr. is born in blood / produced & directed by Doug Shultz ; written by Doug Shultz, Hilary Sio, Thomas Emil. [New York, N.Y.] : History Channel : Distributed in the U.S. by New Video, 2005. ^ "Robespierre and the Terror | History Today". www.historytoday.com. Retrieved 8 February 2018. ^ "Paris: Capital of the 19th Century". library.brown.edu. Retrieved 1 February 2017. The Reign of Terror, or The Terror, refers to a period during the French Revolution after the First French Republic was established. Georges Jacques Danton was a leading figure in the early stages of the French Revolution, in particular as the first president of the Committee of Public Safety. Danton's role in the onset of the Revolution has been disputed; many historians describe him as "the chief force in the overthrow of the French monarchy and the establishment of the First French Republic". The Society of the Friends of the Constitution, after 1792 renamed Society of the Jacobins, Friends of Freedom and Equality, commonly known as the Jacobin Club or simply the Jacobins, became the most influential political club during the French Revolution of 1789 and following. The period of their political ascendency is known as the Reign of Terror, during which time tens of thousands were put on trial and executed in France, many for political crimes. Jérôme Pétion de Villeneuve was a French writer and politician who served as the second mayor of Paris, from 1791 to 1792. The National Convention was the first government of the French Revolution, following the two-year National Constituent Assembly and the one-year Legislative Assembly. Created after the great insurrection of 10 August 1792, it was the first French government organized as a republic, abandoning the monarchy altogether. The Convention sat as a single-chamber assembly from 20 September 1792 to 26 October 1795. The Mountain was a political group during the French Revolution, whose members called the Montagnards sat on the highest benches in the National Assembly. Jacques-Nicolas Billaud-Varenne, also known as Jean Nicolas, was a French personality of the Revolutionary period. Though not one of the most well known figures of the French Revolution, Jacques Nicolas Billaud-Varenne was an instrumental figure of the period known as the Reign of Terror. Billaud-Varenne climbed his way up the ladder of power during the period of The Terror, becoming one of the most militant members of the Committee of Public Safety. He was recognized and worked with French Revolution figures Georges Danton and Maximilien Robespierre, and is often considered one of the key architects of the period known as The Terror. "No, we will not step backward, our zeal will only be smothered in the tomb; either the Revolution will triumph or we will all die." Jean-Marie Collot d'Herbois was a French actor, dramatist, essayist, and revolutionary. He was a member of the Committee of Public Safety during the Reign of Terror and, while he saved Madame Tussaud from the Guillotine, he administered the execution of more than 2,000 people in the city of Lyon. Jean-Lambert Tallien was a French political figure of the revolutionary period. Jacques René Hébert was a French journalist, and the founder and editor of the extreme radical newspaper Le Père Duchesne during the French Revolution. He was a leader of the French Revolution and had thousands of followers as the Hébertists ; he himself is sometimes called Père Duchesne, after his newspaper. The Revolutionary Tribunal was a court instituted by the National Convention during the French Revolution for the trial of political offenders. It eventually became one of the most powerful engines of the Reign of Terror. Marc-Guillaume Alexis Vadier was a French politician of the French Revolution. The White Terror was a period during the French Revolution in 1795, when a wave of violent attacks swept across much of France. The victims of this violence were people identified as being associated with the Reign of Terror – followers of Robespierre and Marat, and members of local Jacobin clubs. The violence was perpetrated primarily by those whose relatives or associates had been victims of the Great Terror, or whose lives and livelihoods had been threatened by the government and its supporters before the Thermidorean Reaction. Principally these were, in Paris, the Muscadins, and in the countryside, monarchists, supporters of the Girondins, those who opposed the Civil Constitution of the Clergy and those otherwise hostile to the Jacobin political agenda. The Great Terror had been largely an organised political programme, based on laws such as the Law of 22 Prairial, and enacted through official institutions such as the Revolutionary Tribunal, but the White Terror was essentially a series of uncoordinated attacks by local activists who shared common perspectives but no central organisation. In particular locations, there were however more organised counter-revolutionary movements such as the Companions of Jehu in Lyon and the Companions of the Sun in Provence. The name 'White Terror' derives from the white cockades worn in the hats of royalists. From 22 September 1792 to 2 November 1795, the French Republic was governed by the National Convention, whose president may be considered as France's legitimate Head of State during this period. Historians generally divide the Convention's activities into three periods, moderate, radical, and reaction, and the policies of presidents of the Convention reflect these distinctions. During the radical and reaction phases, some of the presidents were executed, most by guillotine, committed suicide, or were deported. In addition, some of the presidents were later deported during the Bourbon Restoration in 1815. Jacques-Alexis Thuriot, known as Thuriot de la Rosière, and later as chevalier Thuriot de la Rosière, chevalier de l'Empire was an important French statesman of the French Revolution, and a minor figure under the French Empire of Napoleon Bonaparte. Below is a list of all French heads of state. It includes the monarchs of the Kingdom of France, emperors of the First and Second Empire and leaders of the five Republics. During the French Revolution (1789–1799), multiple differing political groups, clubs, organisations and militias arose, which could often be further subdivided into rival factions. Every group had its own ideas about what the goals of the Revolution were and which course France should follow. They struggled to carry out these plans at the cost of other groups. Various kinds of groups played an important role, such as citizens' clubs, parliamentarians, governmental institutions and paramilitary movements. Society of the Friends of the Blacks: an abolitionist pressure group founded in 1788 by Jacques Pierre Brissot just before the Revolution broke out. Although early revolutionaries would officially denounce slavery, this declaration was initially of little practical consequence. Not until the Haitian Revolution broke out in August 1791 did French politicians begin to seriously consider the factual abolition of slavery, which was eventually legislated on 4 February 1794. The gens de couleur libres had already been granted civil rights on 4 April 1792. Royalists: the term most commonly given to a wide range of supporters of the Ancien Régime who sought to reverse most changes of the Revolution and restore the royal House of Bourbon and the Catholic Church to its pre-1789 authority. Some armed themselves and formed rebel armies, especially in Western France, under the name of Catholic and Royal Army, the most important battleground being the War in the Vendée (1793–1796). Others fled France as émigrés, some of whom would also arm themselves and form the Armée des Émigrés (1792–1814), who together with the troops of the First Coalition and Second Coalition sought to bring down the French Republic and restore the Bourbon monarchy. 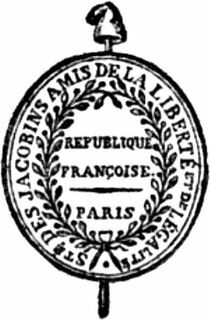 Jacobins : revolutionary club originally consisting of Breton delegates to the National Constituent Assembly founded in June 1789, which soon grew and branched out across France and welcomed non-parliamentarians as members starting in October. Due to the expensive membership fee, the club remained elitist, initially shifting to the right. In Spring 1790, the radical leftist Cordeliers seceded and then in July 1791 the right-wing Feuillants also split themselves off. Together with the Cordeliers, the Jacobin left-wing would eventually come to be known as The Mountain while the right-wing of the Jacobins would become known as the Girondins. From 1790 onwards, Maximilien Robespierre would become increasingly dominant within the Jacobin Club and from July 1793 until July 1794 use it as his powerbase for the Reign of Terror, arresting and executing the leaders of both Cordelier factions, namely the radical leftist Hébertists as well as the centre-left Dantonists. After the Fall of Maximilien Robespierre, the National Convention closed the Jacobin Club on 12 November 1794. Monarchiens : club of centre-right revolutionary monarchists founded in December 1789 by Jean Joseph Mounier. They merged with the Feuillants in 1791. Society of 1789 : club of moderate conservative constitutional monarchists founded in May 1790. They merged with the Feuillants in 1791. Cordeliers : radical-leftist club which split from the Jacobins in the spring of 1790 under the leadership of Georges Danton and Camille Desmoulins. Together with the radical left Jacobins, they constituted The Mountain in Parliament. Until his assassination on 13 July 1793, radical demagogue Jean-Paul Marat played an important role as well. Thereafter, the club was taken over by the Hébertists of Jacques Hébert. Shortly after the execution of the Hébertists leaders by Robespierre on 24 March 1794, the Cordeliers Club was closed down. Feuillants : club of centre-right constitutional monarchists who held the majority in parliament during the Legislative Assembly era. They split from the Jacobins on 16 July 1791 and disappeared after the Storming of the Tuileries. Although enemies of the Ancien Régime, they also opposed democracy. They maintained that the establishment of the constitutional monarchy on 3 September 1791 had meant the French Revolution had achieved its goal and should be finished.